Analog I/O module for Symphony Mk II. Two balanced inputs on XLR and six balanced outputs on DSUB 25-pin connector. 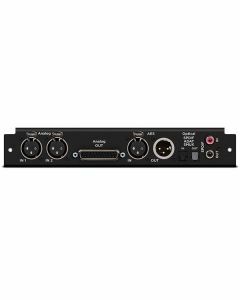 Also provides stereo AES input & output on XLR, two channeles of S/PDIF I/O (192kHz) on RCA and one set of optical I/O ports which support: 8 channels ADAT @44.1/48kHz, 4 channels SMUX ADAT @ 88.2/96kHz or 2 channels of S/PDIF @ 192kHz.